It's nowhere to be found actually. Well, during the process of purchase, your username and transaction ID are given to the retailer you are using. 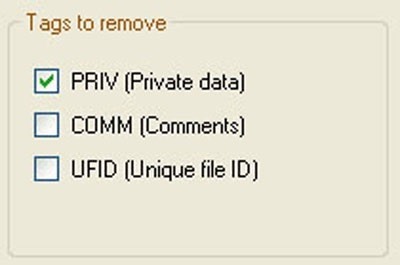 As the song loads for download, software embeds information that carries both the account name and transaction into the music file. After the download, your MP3 then hides away this information deep in its nether regions, never to be seen again...unless you know where to look. 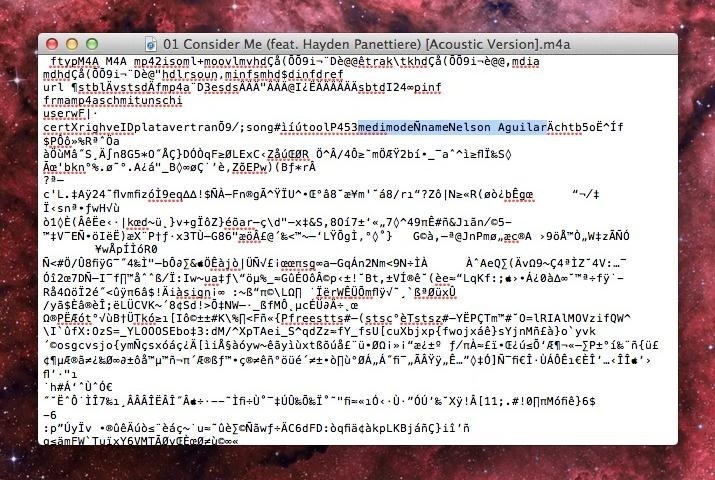 The picture below shows my username (highlighted in blue) engrained in the entrails of an MP3 purchased on iTunes. So what's so important about a song carrying your username and transaction ID? 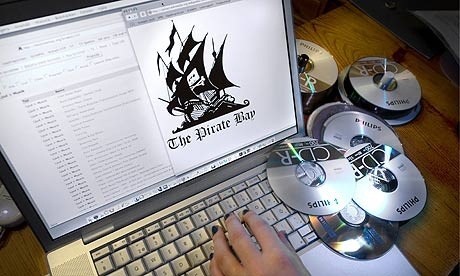 While the data can't be exploited by others to purchase more music or hack into your account, it can be used against you—the original purchaser—if your MP3 is somehow leaked onto torrent sites and uploaded by others. Once a song is released into the wild, record companies can dissect the MP3 and gather the necessary information to press charges against the person who originally purchased the song and allowed it be bounced around on the internet for free downloads. If you want to prevent this from happening, you can use a utility that could strip the personal information from the file, and thanks to Randy G, iDesiccate (Windows only) does just that. So far, Randy G has cleaned over 2,000 files without any problems, but states "I can't guarantee that if you have a corrupted file that iDesiccate won't corrupt it further. So back up your files first and run small batches through it." Once your files run through the program, you should be okay if your files are stolen or purposely released into the wild internet. Without the embedded information, your MP3s should now be squeaky clean! Well, that's not exactly what I meant...but close enough. Just be happy we don't have the same laws as Japan does. Ignorance. Most criminals know how to hide evidence or handle things so they don't get caught. They know and think about how they could be caught, possibly, then they take measures to prevent that! This is literally like shooting someone and then leaving the gun, complete with fresh fingerprints at the crime scene. METADATA and the MP4 container format: learn about them! Apple themselves provide very detailed documentation of their proprietary modifications to the standard MP4 ISO standard in the developer's area. There are metadata nodes called ATOMS in these files, and they're not visible in the file tags, they are hidden to almost all apps (unless you view via HEX editor). These "atoms" contain things like your iTunes account name, email address, unique file ID, exact timestamp of purchase, etc... MP3's are usually not as complex, and Amazon, for instance, will include a unique "Amazon ID" that is stored in the standard "comment" tag. But this was an interesting read, as before this, I had only heard of Atomic Parsley. This seems to be a lot easier to get the job done on a folder really fast. Atomic Parsley is old, and not nearly as easy to use, but is for the power user, as you can do nearly anything involving metadata/atoms to a precise degree. My only comment on the actual "app" itself is it's distributed in "ClickOnce" deployment format (Visual Studio, .application), and effectively runs "server-side". Why? Why not distribute an app compiled to binary/executable? Seems a bit strange, but then again he could just be somebody doing something new-- as there are advantages to this method of deployment. Alright, can I have a version of iDesiccate that I can store OFFLINE and install at any time without having to worry about some server somewhere going down or being moved? I downloaded setup.exe -- but that just downloads idesiccate.application -- so I downloaded idesiccate.application -- but that just tells me it's going out on the internet to download something and won't tell me what. If this is the only way to get this tool, it is of no use to me.